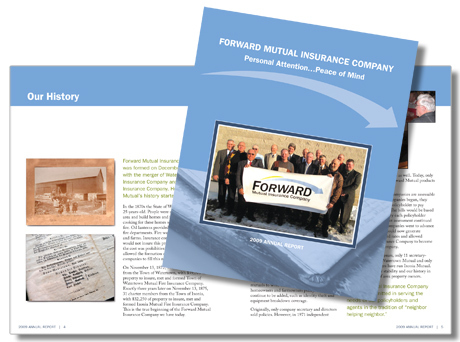 Last month Forward Mutual Insurance Company held its first annual policyholders’ meeting. It was history in the making, even though the people present have long been gathering for annual meetings. This is because Forward Mutual is the merging of two longtime companies with very interesting histories. As Forward’s staff and I worked together on their annual report, we decided it should be a record of where the two companies came from individually and where they’re going together. Forward’s attitude is definitely towards the future, but it also was important to celebrate one last time the two companies that formed it—Ixonia Mutual and Watertown Mutual. One of the interesting things we noted in the annual report was the change in communication over the years. Both companies were formed in the 1870s and back then they wrote all their policies and records by hand. In fact, up until 1919, Watertown Mutual wrote its records in German. Picturing this, along with an area family photo, added historical interest to the annual report. The topic of communication and change came up during the meeting as well. President Howard Wiedenhoeft spoke of announcing the upcoming annual meeting with letters and newspaper advertisements. He suggested that in today’s world, maybe they need to change the way they do this. Perhaps Dorothy Henderson said it best during her welcome to the new mutual. Dorothy is the senior reinsurance marketing representative for Grinnell Mutual, the reinsurance company to Forward Mutual. She made insightful comments regarding change. We can choose to ignore change and thereby resist it by continuing to work and relate as we have in the past. I have two sons that live out of state. I resisted using text messaging and eventually the frequency of our communications drastically decreased. They would text me and I would call them back. I disrupted the flow. Once I started responding to their text messages, via texting, the frequency of our communications increased. Many of us react to change. First we ignore it, but once we realize the trend is not a fad, we react either positively or negatively. This often puts us behind the curve and the delay might have caused us to miss opportunities. There are a few individuals and companies that embrace change. These people recognize that change is inevitable, and decide to lead it rather than follow it. Thanks, Dorothy, for these wise words. Great work, Diahann! And great comments about change and adaptation to change. I think in our business – design – you’ve gotta at least be a reactor. But it’s good to get a reminder that it’s possible to jump in and shape the change.